Community Baby Shower was a huge success!! Meet us at Albertsons and Fred Meyer and go shop for baby items to help the struggling mothers and children in our community. Thank you for your support! Donation boxes out March 29 at several locations (see flyer), if you can’t make the April 14 date. Looking for Crafters for Baby Shower! 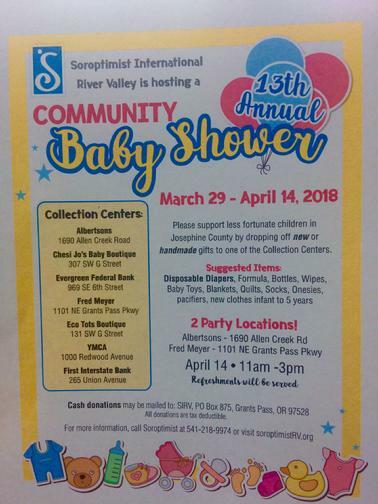 Soroptimist's 2018 Community Baby Shower will begin on March 29 and end on April 14 with our "party" at 2 locations: Albertson's and Fred Meyer! We hope to collect lots of baby items for families in need!